Towering above the smiles of joyful tourists and beaming residents is the iconic Put-in-Bay monument. A comforting beacon to all who know its history, the memorial hearkens back to Ancient Greek architecture and invokes a sense of wonder and pride. This symbol of peace and prosperity carries an inspiring legacy of hope and endurance, and it is one of the most famous landmarks on the Lake Erie Islands. A mighty 352 feet high, Perry’s Victory and International Peace Memorial (its official name) is one of the nation’s tallest monuments. In fact, there are only three monuments in the country that are taller (Gateway Arch, San Jacinto Monument, and Washington Monument). The structure of Perry’s Monument is known as a Doric Column (a pillar in Ancient Greek architecture used to support buildings), and it happens to be the largest freestanding one in the world. Although the monument appears to be white from a distance, it is actually made of hollow concrete with a pink granite rock facing. There are twenty large grooves on the column, and fine lines are edged into each granite block. Because of these precise details, onlookers notice the gem-like dazzle of the monument on Put-In-Bay almost immediately. On September 10, 1813, one of the most important battles in the War of 1812 took place—the Battle of Lake Erie. Led by Commodore Oliver Hazard Perry, whose operational base happened to be Put-in-Bay, nine American ships captured six British ones (and 306 soldiers). Historians claim that this victory was pivotal in the war. The American victory allowed their forces to invade Canada and defeat the British at the Battle of the Thames. The triumph also prevented British troops from moving to the center of the United States along the waterways. 27 American and 41 British soldiers lost their lives that day—including three officers on each side. The soldiers were buried at sea, but the six officers were buried side-by-side on the island, in a clearing, underneath a sole willow tree. For many years, this “Lone Willow” served as the only memorial of the battle and Commodore Perry’s achievement. Years later, in 1852, many people (including government leaders and veterans) recognized how important Perry’s victory at Put-in-Bay was. They started a movement to build a monument to memorialize the battle. And so began the lengthy challenge of constructing Perry’s Victory and International Peace Memorial. In 1858, six years later, Put-in-Bay held a 45th Anniversary Celebration for the Battle of Lake Erie. Eight steamers, 24 sailing vessels, and a fleet of ships decorated the bay, and 8,000 people from the Great Lakes region (including Sandusky, Cleveland, Toledo, Detroit, Erie, Buffalo, and others) visited the island. The ceremony featured music and speeches from all sorts of government officials. On this day, the Association was re-structured and the Joseph de Riveria St. Jurgo, the owner of Gilbraltar Island (just off the coast of Put-in-Bay), one-half of his island as a site for the monument. On Sept 10th, 1859, 15,000 people attended the ceremony to place the cornerstone for the monument. Cincinnati sculptor T.D. Jones designed a column at the request of the Association. His design included a giant pillar (160 feet tall) with an 18-foot statue of Commodore Perry at the apex. During the celebration, Masonic officials traveled from Put-in-Bay to Gilbraltar and sealed the following items in an airtight box within the stone: The Declaration of Independence; the United States, Ohio, and Battle of Lake Erie Monument Association Constitutions; the Bible; some coins; some newspapers. A proper, fitting memorial appeared to be on the horizon. While the cornerstone did indeed feature a type of tribute, it was not the type of memorial the Association envisioned. Legend says that Cooke built his shrine to satisfy the deed’s language and prohibit he Association from taking one-half of his land for the memorial. At 1869 celebration the following year, the Association chose to build the monument near the “Lone Willow.” But, only about 4,000 people were in attendance, and the Association was unable to garner enough support or fundraising. A few decades passed without any breakthroughs. Former President Rutherford B. Hayes even partnered with the Maumee Valley Monumental Association to obtain congressional funds for the project. Predictably, their request was denied, leaving many to wonder if the monument would ever be completed. A “monumental” accomplishment finally occurred in 1899. The United States government decided to donate Civil War cannons to “memorial societies” that wanted to use them as decorative items. The island requested—and received—eight cannons and 88 cannon balls. The cannons were eventually placed in the village park—after a year of stagnation as various officials argued over freight prices, bills, and transport responsibility. During this time, the “Lone Willow” over the deceased officers decayed and fell. So, in 1900, the Association arranged the Civil War cannon balls over the grave where the Lone Willow once stood. Supporters, however, still yearned for a better memorial…. In 1908, the Put-in-Bay board of trade’s director of publicity suggested that the island host a “great centennial celebration” for the Battle of Lake Erie from June to September 1913. The board reached out to the state government and raised $182,550 for the gala and monument. By 1910, ten states had agreed to participate in the centennial celebration and the memorial’s construction. John Eisenman, a famous architect of the time, created a sleek, modern monument design to create more buzz and interest, and, finally, an official site for the monument on Put-in-Bay was approved. That same year (1912), excavators began clearing the land and building the monument. The day after the centennial celebration, September 11, 1913, the fallen officers were re-buried during a solemn ceremony. Two years later, on June 13, 1915, the Perry’s Victory and International Peace Memorial finally opened to the public. [PIC] Unlike many of the grand jubilees of the past, nothing extravagant accompanied its true opening. From the moment it opened, the monument became a major tourist attraction, so much so that on June 2, 1936, the federal government placed the memorial under its control and supervision. Perry’s Victory and International Peace Memorial is just one of Put-in-Bay’s many treasures. The Put-in-Bay Monument reminds visitors and locals of a battle and a victory—and of something much more. It’s a tribute to peace, safety, and stability. It’s a symbol of joy. It’s an image of freedom. It’s a picture of hope. It represents that blissful feeling one appreciates on the Lake Erie Islands—and most notably here at Put-in-Bay. 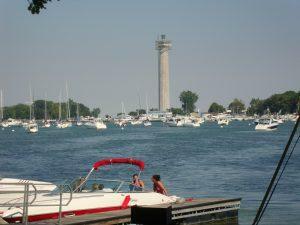 10 Things to Do In Put in Bay That Are Free!